All training, whether for strength, flexibility, or endurance, is training for movement. All athletes train to move more efficiently: baseball players workout to hit and throw the ball faster and further, weightlifters train to move in a certain manner under more and more stress, even bodybuilders – despite the shrinking focus on posing routines – do exercises so they can flex every single muscle in their body at once. All of these have one baseline in common: improving the mechanisms of movement. This is a concept that escapes most “average joes” as they pad their way to the gym in the mornings and afternoons, or turn on the latest P90x/Insanity muscle confusion workout DVD that promises to get your ripped for three easy payments of an arm and a leg. Many people work out toward a vague ideal of aesthetics, trying to capture what society has told us is a “healthy” body image. In this pursuit of bursting sleeves, barrel chests, and six pack abs, we trick ourselves into thinking that the end of working out is to lose weight (get “shredded”) or be healthier, without realising that a good diet and being semi-active throughout the day can create an extremely healthy person who never set foot in a gym. 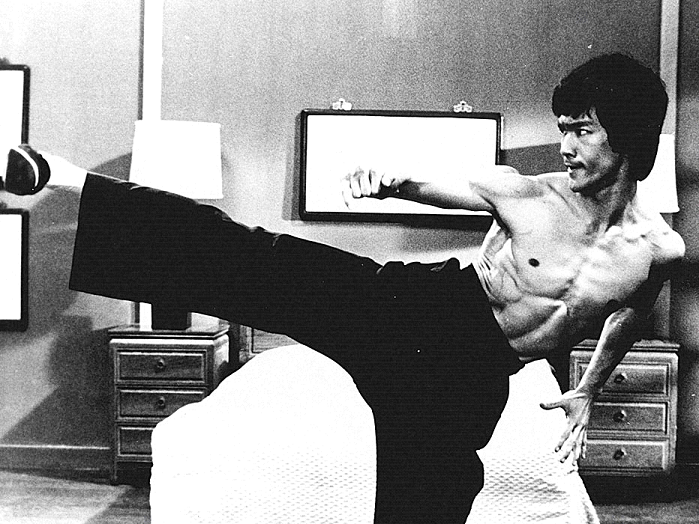 We want the shredded physique of Bruce Lee from Enter the Dragon, without realising that his physique is the by-product of a training regime crafted to make him a better fighter. To continue the example, there are many blogs, forums, and websites on the internet that quote pages, almost verbatim, from The Art of Expressing the Human Body in an effort to show people how to get Bruce’s “lean and shredded look”, but don’t address the fact that Bruce was training towards one specific goal – a goal that is most likely different from the average persons. In fairness, if someone is not an athlete, it’s difficult to know what he should train for. What movement is a middle-class forty-something with a desk job and two kids at home supposed to be preparing for? The thing is, this is not about training, it’s about mind-set. The difference is subtle, which leads many people to believe it doesn’t matter if the end is the same, but the end hardly justifies the means. As Thegn has mentioned before, “we live in a culture that’s all about appearances”. Because of this, many people pack themselves into gyms and torture themselves, doing exercises they hate, as a result of the way American culture tells them they should act. The sad fact is weightlifting is simply not for them. Why would you play basketball if you hated it? The same rule applies. If someone is that concerned about being healthy, it would be more beneficial to eat a nutritious diet (no getting out of that one, sorry) and take up some regular activity that you actually enjoy. If you think you’re too much of a nerd for sports, you can even do laser tag – running up and down ramps for half an hour with a fifteen pound vest on your back is a good cardio session in almost any circle. If you are part of the few who actually enjoy working out, or you feel you are so obese that you need the gym to get healthy before you end up in serious trouble, then you need to have a clear reason in mind for doing what you do. Here’s a hint: getting six pack abs is not a good reason. Athletes aren’t fit because they have six pack abs, they have six pack abs because they’re fit. For example: if you’re overweight, you should be training to move better in your own body. If you’re already healthy, you should be training to move and take care of yourself, your home, and possibly your family without injury. Twenty inch arms don’t matter as much as being there for your children when you’re forty. Even lifting and getting stronger for its own sake isn’t a bad reason. The idea that “I need to lift this 230-pound barbell off of my chest six times, because if I don’t I will not be able to lift 235 next week, and will have failed in surpassing my own limits” is one of the purest forms of the sport. Following this mindset will do two things. 1) It will make you more confident in who you are as a person, and help you to understand that person better. 2) It will help you to devise a more effective and useful routine geared towards what you want to do, as you will no longer be attached to the hordes of BS out there, most of which is trying to take your money. So work out, if you want, if you feel there’s something you want to train for, or don’t if you don’t. If you are going to do it, remember what you are doing it for, because if you don’t know, then what’s the point, anyway?